Directive 2004/17/EC governs the rules, provisions, and procedures entailed in public procurement contracts awarded by EU Member States in the water, energy, transport, and postal services sectors. In the course of the eight-year (1996–2004) gestation period of an EC public procurement policy that would meet the challenges of a globalised economy, it became clear that these utilities required a legislative framework distinct from the general coordination of award procedures that finally emerged as Directive 2004/18/EC. 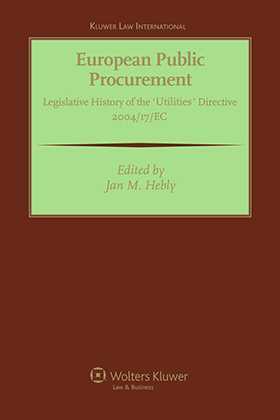 Introducing the book are excerpts that give a general picture of the reasons that led to the intention to replace the earlier procurement directive for the utilities sectors (93/38/EEC). Then follow excerpts that give an insight into the drafting of the recitals in the Preamble, the articles, and the annexes. The book concludes with a chronological overview of the legislative documents associated with Directive 2004/17/EC and a Keyword Index. Along with its companion volume on Directive 2004/18/EC, this important book will be a powerful resource for lawyers and policymakers engaged in the practice and development of European procurement law. It will also provide both practitioners and researchers working in the area of European procurement law with an incomparable desktop reference on the Utilities Directive. Preface. General Explanation. Preamble: Recitals 1–60. Articles. Title I: General Provisions Applicable to Contract and Design Contests. 1. Basic Terms. Article 1, Paragraphs 1–13. 2. Definition of the Activities and Entities Covered. Articles 2–9. 3. General Principles. Article 10. Title II: Rules Applicable to Contracts. 1. General Provisions. Articles 11–15. 2. Thresholds and Exclusion Provisions. Articles 16–30. 3. Rules Applicable to Service Contracts. Articles 31–33. 4. Specific Rules Governing Specifications and Contract Documents. Articles 34–39. 5. Procedures. Article 40. 6. Rules on Publication and Transparency. Articles 41–50. 7. Conduct of the Procedure. Articles 51–59. Title III: Rules Governing Service Design Contests. Articles 60–66. Title IV: Statistical Obligations, Executory Powers and Final Provisions. Articles 67–75. Annexes I–XXVI. List of Legislative Documents in Chronological Order. Directives and Other Legislation Referred to in the Legislative History of Directive 2004/17/EC. List of Abbreviations. Index.